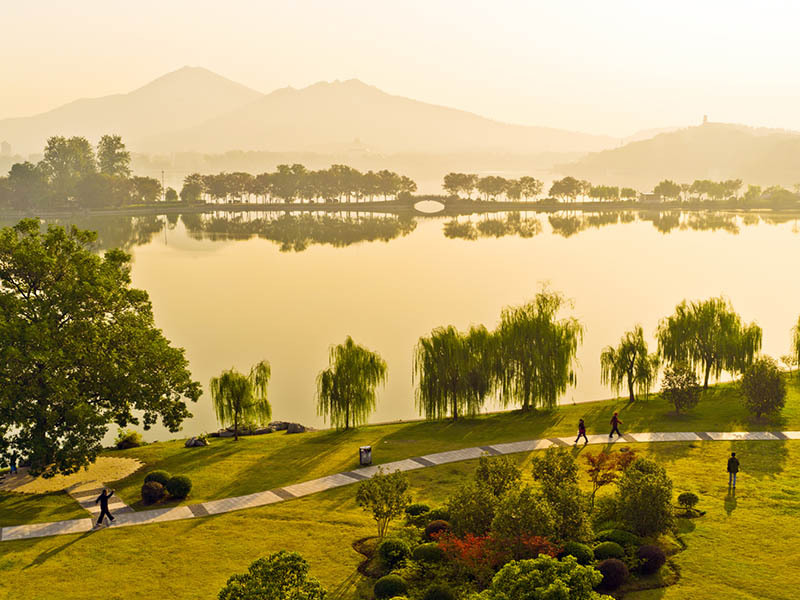 The 472 hectares Xuanwu Lake Park was the largest Imperial lake garden in China's history. It is also the largest downtown park in the south of China. When inside the park it does not feel like you are in the middle of a huge city. The park is laid in a traditional Chinese fashion with lots of rocks and walkways. You can see both the ancient wall of Nanjing and skyscrapers behind it. 'Old vs. new' comes to mind in this spectacular place. Nowadays the lake park has become one of the top choices of local Nanjingers and international expats for their (evening) fitness. There are nice walk ways surrounding the lake. This is a great place to unwind after a hard day's work. Especially in the evening, this is an ideal place for jogging, relaxing strolling or just going for a walk. Different Nanjingers organize casual walking groups to circle the 444-hectare park or play music and dances. If you are interested to find out how Nanjingers spend their nights, this is the place. The lake park has various gates. The main gate is 'Xuanwu Gate', near Metro Line 1 Xuanwu Lake Park Station. The other main gate is 'Heping Gate' with Nanjing Central Station just lying north. The main entrance Xuanwu Gate is also a gate of Ming City Wall. You can pay RMB 15 (known at the time of printing) and get on the gate to take a stroll on the Ming City Wall. The stroll starts from Xuanwu Gate to Shence Gate in the North. It is an ideal session for photo taking and feeling the inner peace, presenting a nice view of the mixture of old and new, urban and nature. Shence Gate is the end stop of this stroll. It is the most well maintained and last opened gate in Nanjing which is easily accessible by metro line 1. Get off the Shence Gate, walk South along Zhongyang Road and you can find metro line 1 Xinmofan Malu (新模范马路) Station Exit 2 or 4. Otherwise, walk Southeast along Longpan Road to access metro line 1 Nanjing Railway (南京站) Station Exit 1. Line 1 Xuanwu Lake Park(玄武湖公园) Station Exit 3/4. Walk along Xuanwu Gate Road for about 5 minutes.